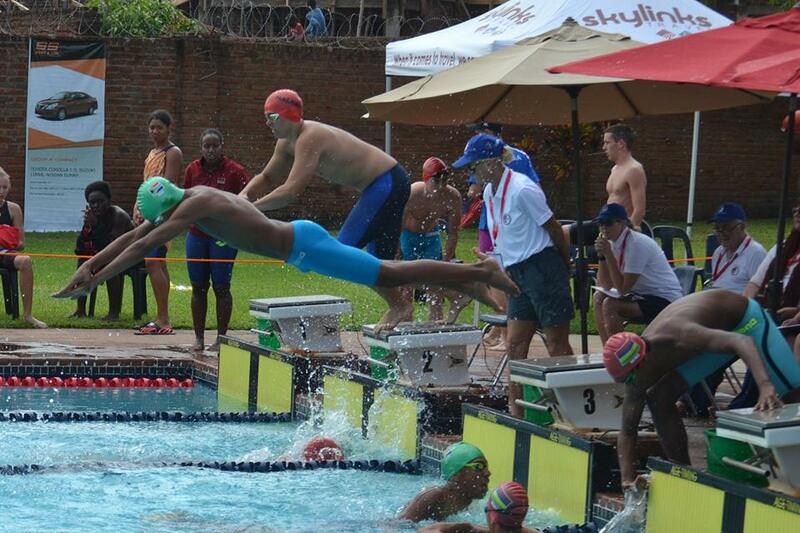 Pictured: Young Southern African swimmers competing in last year’s CANA Zone IV championships in Lilongwe, Malawi. A strong contingent of athletes represented South Africa at the Confederation Africaine De Natation Amateur (CANA) Zone IV Junior Championships held at the Oanob dam outside Rehoboth over the past weekend. Teams from all over Southern Africa competed in Water Polo and Open Water Swimming disciplines. Last year the South African team finished second behind Zambia at CANA Zone edition in Malawi. 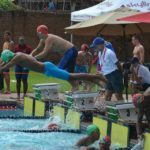 This year Namibian swimmers managed to secure the second place with four gold, eight silver and 6 bronze medals. The South African dominated the CANA Zone IV Championships medal table after an action packed day of Open Water Swimming at the Oanob Dam. The day started with the men’s 14-15 age group 5km event, where South Africa’s Dennis de Villiers, Connor Albertyn and Alex Wehmeyer won the gold, silver and bronze in 01:04:28, 01:04:29 and 01:15:52 respectively, while on the ladies’ side, it was SA’s Leigh McMorran and Catherine van Rensburg that claimed the gold and silver in 01:04:23 and 01:05:20, with the bronze going to Kenya’s Nurayn Bagha in 01:28:43. Albertyn (00:40:38) and Van Rensburg (00:41:39) went one better in their respective 3km races to claim the gold medals, while De Villiers (00:41:33) and McMorran (00:41:55) settled for the silver. The bronze in the men’s event went to the Seychelles’ Alain Vidot in 00:44:12 and the ladies’ to Zimbabwe’s Ella Allardice in 00:47:13. SA’s Flippie van der Spuy, Zac Ellis and Muhammad Adam topped the medal podium in the 16-18 age group 5km race in 01:02:53, 01:04:24 and 01:04:26, while in the ladies’ event, SA’s Stephanie Houtman (01:04:41) and Tasneem Ebrahim (01:11:12) won the gold and silver, with Namibia’s Joanne Liebenberg winning the bronze in 01:13.20. Van der Spuy (00:40:57) and Ellis (00:41:34), as well as Houtman (00:40:40) and Ebrahim (00:44:55) were once again the gold and silver duo in the 3km events, while the bronze in the men’s race went to Namibia’s Matthew Gertze in 00:46:07 and the ladies’ bronze to Zimbabwe’s Gemma Schonken in 00:48:26. SA’s Refiloe Mashao finished with the gold in the 19 and over 5km race in 01:04:25 with Namibia’s Paddy Murphy a close second in 01:20:26, while Mashao also bagged the gold in the 3km event in 00:40:42 ahead of Namibia’s Jureck Johannesson in 00:48:23. The 12-13 3km gold medals went to SA’s Connor Jay in 00:46:17 on the boy’s side and SA’s Tiara Finnis in 00:49:02 on the girl’s side. In the Non-Championship races of the day, the Namibian trio of Jose Canjulo, Christopher De Jager and Keanet-Peter Ratheman completed the medal podium in the 14-15 age group 500m race, while the host nations’ Kyle Herbst, Mackenzie Spatm and Corley Viljoen scooped the gold, silver and bronze in the ladies’ event. In the 16-18 age group 500m race, Namibia’s Rene Viljoen was victorious, while the silver was claimed by Uganda’s Hayyan Kasitu, while the ladies’ gold went to Carussa Esslinger and the 19 and over men’s gold was won by Namibia’s Dentie Louw. There was also a 1km non-Championship competition where the Seychelles’ Thierry Payet won the 12-13 men’s race, while the gold in the 14-15 ladies’ section went to the Seychelles’ Khema Elizabeth. The 14-15 1km gold and silver went to the Seychelles’ Joshua Miller and Nathan Nagapin, with the bronze going to Angola’s Filipe Freitas, while in the 16-18 1km event, the Seychelles’ Tyler Fred claimed the top spot ahead of Namibia’s Arkell Wellmann and Elias Nakaleke. In the ladies’ race, Namibia’s Tiana Essliner won the gold. Elago Naukushu and Gabor Salamon from Namibia won the gold and silver in the 19 and over 1km, while Angola’s Maria Lopes walked away with the ladies’ title.